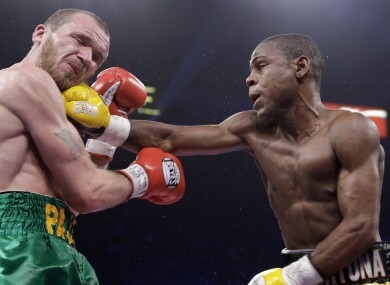 Javier Fortuna connects with Paddy Hyland's jaw. CLERMONT VERSUS LEINSTER was not the only clash of unbeatables at the weekend – Dublin boxer Patrick Hyland put his 27-0 record on the line against the impressive Javier Fortuna. The 22-year-old from the Dominican Republic is recognised in the boxing game as a genuine talent and his points win over Hyland, after he was taken the distance is expected to herald a lengthy reign as WBA featherweight champion. Hyland displayed remarkable fortitude to slug away amid a flurry of blows from his younger opponent. Fortuna was in unfamiliar territory, being taken to 12 rounds, but the judges unanimously awarded him the bout. Speaking to irish-boxing.com, after the Las Vegas fight, Hyland said, “I’m sorry for everyone back home that I won’t be bringing the World title belt back with me. A lot of fans made the long journey from Ireland to cheer me on in very hard economic times and I really appreciate that. Fortuna, a southpaw, had the better of the early rounds before Hyland started to exert his influence. He had the Dominican on the canvas in the ninth round but the referee adjudged it a slip and not a knock-down. The Irishman entered the final round requiring a knock-out to win but Fortuna used an effective combination of jabs and grapples to keep him at bay. A beaten but unbowed Hyland declared, “A lot of people were predicting that I would be out of my depth against Fortuna and were tipping him to blow me away in a round or two. They obviously didn’t know me and I just found it pretty funny to be written off like that but I’m a stubborn Irishman and I think I proved a lot of people wrong. “Fortuna was billed as the next big thing in boxing but I felt I burst his bubble in there. Hyland returns to Dublin this week but has enjoyed the fight night experience in Vegas immensely. He said, “From press conferences with 50 Cent and having Mike Tyson support me at the weigh and then having Mitt Romney ringside watching the fight and of course Snooki supporting me as my promoter. Hyland has next targeted bouts with IBF champion Billy Dib or the winner of the WBO title clash between Orlando Salido and Mikey Garcia. Email “Hyland leaves Las Vegas with enhanced reputation but no world title”. Feedback on “Hyland leaves Las Vegas with enhanced reputation but no world title”.